Arnaud Djoum describes himself as "an aggressive midfield player with good technical ability"
Arnaud Djoum hopes to put down roots at Tynecastle despite only being handed a contract until January with Hearts. The former Belgium Under-20 midfielder signed for the Scottish Premiership club this week having left Polish champions Lech Poznan in the summer. "In the last few years, I've moved a lot and I think I need to be stable for a longer time," said 26-year-old Cameroon-born Djoum. "I will work hard to stay here for a longer time." Djoum made only three appearances in his five months with Lech having spent the first half of last season with Turkish Superleague outfit Akhisar Belediyespor. And, having missed out on pre-season training, he does not expect to win an immediate starting place with Hearts. "I need a bit of time as I have not had a lot of preparation, but maybe in a few weeks I can start a game," said the midfielder who was an unused substitute in the midweek Scottish League Cup win over Kilmarnock. "Wednesday, I was on the bench already and tomorrow I don't know yet, but I think I can be on the bench at Celtic Park." Having started his career with Brussels, Djoum had a spell with Anderlecht before moving to Dutch outfit Roda to win first-team football. Now he wants a return to the stability he found in six seasons with the Kerkrade club. 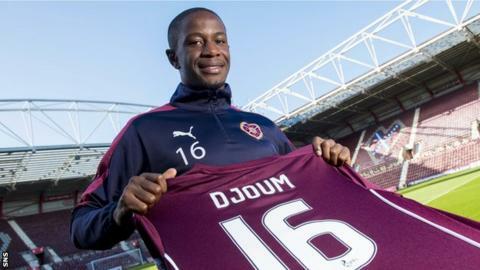 "I had interest from countries like Romania and Cyprus, but I wanted to go to a country like Scotland and, when Hearts came, I was really happy," said Djoum. "Everybody knows about Celtic and Glasgow Rangers because they have played in the Champions League and friends have told me a lot of good things about Hearts. "I want to stay here because I've seen the facilities and the people here are great, the coach and players. "They like to play football and don't just play the long ball. Short passes, trying to create with a lot of movement - that's my type of game." Djoum, who impressed Hearts head coach Robbie Neilson on trial, thinks he can benefit the Edinburgh side. "I am an aggressive player with good technical ability," he added. "I have a lot of experience now - I am 26 and I've played in a lot of countries - and I think I can bring that to the team."